So, when the newsletter editor isn’t there, you get a pretty short newsletter 😉 Matt Goodwin from the Yamhill County Emergency Management Office was there and I heard he gave you all a good scare. Hopefully he also gave you some info on what will happen in Yamhill County. This week, we’ll be hearing from the Red Cross about how to take care of yourself and your family in an emergency. 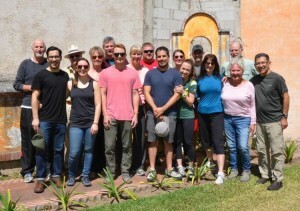 Follow the blog for our Rotarians in Guatemala Auggie Gonzales (and his wife Maureen) is again leading the group that includes Alan Methven, Jim McMaster (and his wife Melody and son, Spencer), Grant Austin, and dentists and other Friends of Rotary in Guatemala. They are doing good work and you’ll enjoy the pictures and blog that Auggie is doing. Check it out below. Roster on Wheels: This is a really good way to have every Rotarian’s e-mail and phone number handy in your phone. I’ve already used it a couple of times to send an email and it is great. It’s pretty easy to load on your smart phone. Here’s the links to add this directory of Rotarians (and more info as well) to your phone. Here’s an interesting offer from Rotary International that can benefit you and all the projects that the Rotary Foundation makes possible. We are pleased to announce that eBay, the world’s leading online auction website, will donate a portion of its sales from select Live Auctions to Rotary beginning February 2016. Rotarians and their friends and families are encouraged to visit eBay Live Auctions each month to see what is available for real-time bidding from hundreds of auction houses. 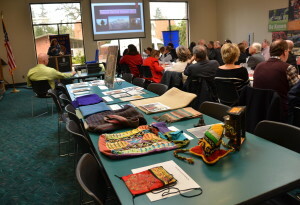 Each month, Rotary will be featured as the beneficiary of a designated set of eBay Live Auctions. Products may include antiques, rare books, sports memorabilia, watches, stamps, art, and fine jewelry. Please visit eBay Live Auctions to see the featured auctions and browse the catalog of items available for bid. The more items sold, the more Rotary benefits! Please share the news about this exciting relationship between Rotary and eBay with the Rotarians in your club. This special offer by eBay is being launched first in the United States, so we look to your Rotary club for its support. If there are questions, please contact rotarysupportcenter@rotary.org. Tony LeLack heads up our Dictionary Project. Good thing, since those boxes of books are really heavy! It was a busy day at Club on Wednesday. Prez Jim McMaster shared a letter from the organization we work with in providing dictionaries to all 3rd graders. 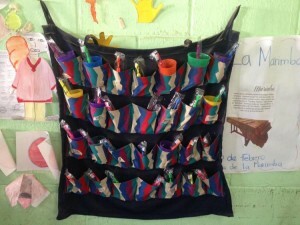 Our participation in that program is part of getting millions of books into the hands of kids. How great is that! 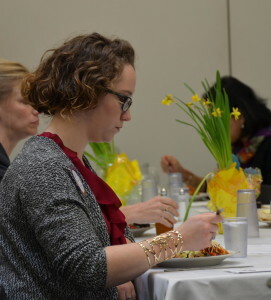 Our guests included prospective returning member Nicole McIntyre. It will be great to have you back. Sarah Reid with GFU sports marketing was here with the Women’s Basketball coach and the Bruins are doing fantastic. They finished their year with a perfect season as they move into the playoffs. Sarah related how connected sports and academics are in that students participating in sports are usually good students. They take their leadership skills learned on the court into the workplace. Sarah will work with the Auction committee to have tickets for various GFU sports at the auction. Congrats GFU and thanks. The Guatemala trip starts February 28th and while they are down a few dentists, they are still ok, and this year Prez Jim will be joining the crew. We used the duck money today (matched with $200 from Geoff Gilmore) to send with Auggie Gonzales to purchase locally made items. We put in over $300, so with Geoff’s $200, Auggie will be busy shopping. 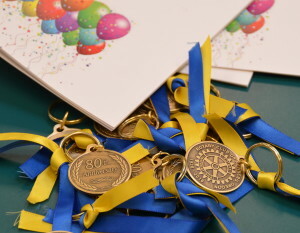 We had a short recap of our 80th anniversary celebration. It was a fun evening with 15 past presidents in attendance. Melody McMaster did a wonderful slide show of our story and we’ll be sharing that at a club meeting in March. Also be sure and pick up your commemorative 80th anniversary key fob and program book at our next couple of meetings. 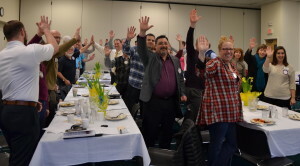 High Fives for Newberg Rotarians celebrating over one million dollars given to youth. It’s auction time and chair Grant Gerke got us all fired up to start soliciting items and getting them in. As Grant said, TODAY IS GO TIME!!! It’s easy to do, just ask, people like to give. 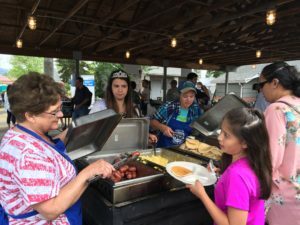 The money isn’t just money, it is what allows us to help kids that are falling through the cracks, support those kids heading to college and every kid in-between. 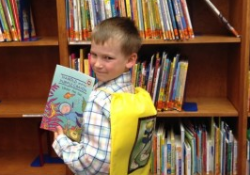 Our Rotary Club Foundation sponsors the library’s summer reading program. 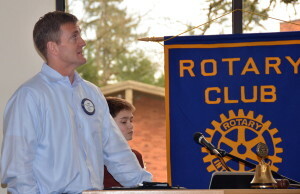 Probably every child in our community has benefited from a Rotary project and the Auction makes that happen. And we need your items that you’ve solicited! Our goal is to net $168,000 this year. $10,000 goes to the club for operations (only from the sale of Golden Tickets), the paddle raise will hopefully provide $40,000 for Helping Hands and after expenses (like the dinner, printing and the wonderful decorations that make it a special night provided by Jan Winder and her crew) we anticipate having $65,500 to put into the Foundation coffers. Sponsors and your dinner tickets make a big difference too as the more sponsors and tickets sold, the more auction money that goes to the Foundation. 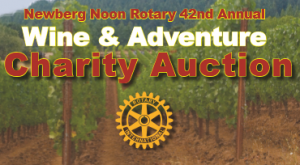 Go to our Facebook page www.facebook.com/Newbergnoonrotary and share the auction information on your Facebook page. Like our Facebook page too. We’ll be putting up Auction promos over the next 8 weeks (yes, just 8 weeks!) and share those on your page. 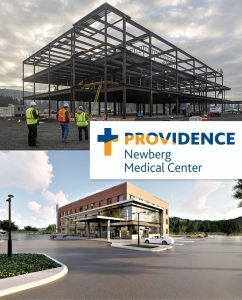 Go to www.newbergrotary.org and click on the auction link and you can buy your golden ticket, your dinner ticket and even register your auction items. When you register your auction items, just print out the receipt, attach it to the item and either drop it off at Newberg Ford (thanks John Kerekanich) or bring it to club. It’s GO TIME!!!!!! Mike Caruso will be heading soon to the Rotary Council on Legislation which works out the rules for Rotary. Think about it as the United Nations for Rotary with all the different countries coming together with their different backgrounds to make the rules. As Mike says, the 4 Way Test is the guide. Stan Kern brought his son-in-law, Dale Welcome, who has been a Rotarian and is interested in joining our club since moving to the area. We’ll be glad to have you join us Dale. 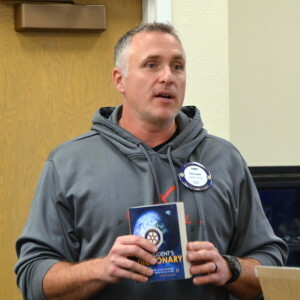 Curt Walker brought his wife Sheri (aunt and uncle to one of our speakers, Rotarian Jenni Ferrell). Deborah Mumhill from the GFU Office of Student Success asked our help in thwarting a hiring scam that is targeting students. Any of our companies that have jobs or internships for students are asked to make the first contact to the GFU hiring office by phone as these scammers are using our local company names and phone numbers (off by one digit) and hiring students, especially for foreign work where the student sends in thousands of dollars for “housing” and loses their money on a false job. Auction News: Get your Golden Ticket from Scott Karn or online at www.newbergrotary.org auction link for just $100. It gives you a 1 in 100 chance to have your pick of the live auction items that include vacations, jewelry and other high end items. This will be Grant Gerke’s last year as chair of the auction after 5 years. 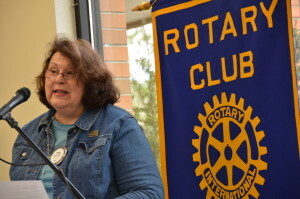 It’s time for other Rotarians to step up to this very important job. When you are thinking about this, remember, we now have a hired “auction administrator” that manages the paperwork and other details, so it’s not as onerous as it was when Grant started 5 years ago or when others did it before him. Talk to Grant or Leah if you are interested. Today we heard from our Nepal Dental Mission from November. 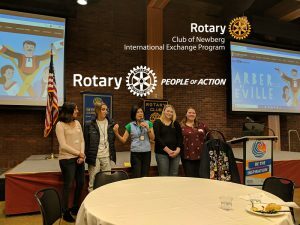 Laura Tilrico thanked the club for their support and shared the history of her connections with Bishnu Subedi, Kathmandu Rotarian. 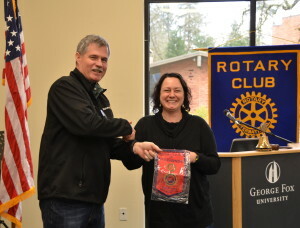 Jenni Ferrell presenting Prez Jim with the banner from the Rotary Club of Kathmandu. Our group presented our banner to the Kathmandu club. Jenni Farrell shared her journal of their adventure as well as her photographs. The people are generous and kind and welcomed the Rotarian group with leis made from marigolds and hosted a dinner and local entertainment. Eric Bergquam was the lead dentist on the project and recounted how just 3 weeks from departure their trip was almost derailed due to political issues with India and Nepal (India is not allowing any resources into Nepal) that resulted in their plane reservations being cancelled, no fuel to fly out of Kathmandu. They were able to re-book (at a higher price and a longer trip) but still made it. They had to come in on a plane that was large enough to carry sufficient fuel to fly in and then out again without refueling as there is very limited fuel in the country. Eric shared that the quality of dentistry is pretty rough in Nepal. His dental assistant, Anina Chism, knew more than some of the Nepalese dentists and she actually did a filling, something she’s not authorized to do in the US. The group did a lot fillings and extractions on hundreds of children. There was some frustration in that they couldn’t do everything that was needed, but they made a huge difference for so many. Some of the items from Nepal. Some will be at the auction for your bidding pleasure. The group set up the permanent dental clinic with the equipment donated by Adec which will allow many people to have dental care in the future. Eric also brought to club the Rota-Dent equipment and the Rota-Chair, projects of our Rotary Clubs that make it possible to do these kinds of mission trips, including our continuing trip to Guatemala. Eric’s son Ian prepared a slide show with all the pictures and he related all the other things the group did including riding on an elephant and going on a boat in a river with rhinos and alligators. They were able to take a plane ride over the Himalayas and were impressed with the temples and architecture. It was still a shock to see all the buildings that were destroyed in the earthquake. We’re working on getting Ian’s slide show uploaded to our web site. 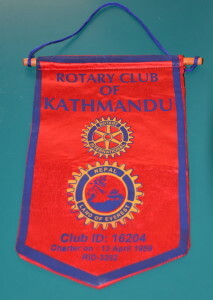 The Rotarians of Kathmandu were very generous to our group, which was especially touching considering how difficult things are in their country with the devastating earthquake last spring and the political issues with India. 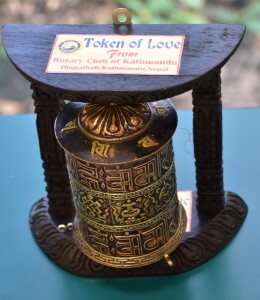 A Nepalese prayer wheel, a gift from the Rotary Club of Kathmandu. It was a tremendous experience for all our travelers and one they won’t forget. Thanks Rotarians for making this happen. 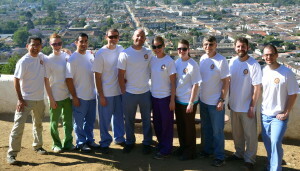 It’s getting close to the Guatemala Dental trip and people are getting their passports ready. Auggie announced that one of their regular dentists broke his neck (he’ll be ok) and won’t be able to attend and his wife also won’t be coming so they’ve lost two regulars. If you’re considering going, check with Auggie Gonzales. Auction News: You can go online to buy tickets and even enter your solicited items. Just check it out www.newbergrotary.org You can’t miss the auction link! Marge O’Connell is back from her trip to Hawaii to celebrate her 87th birthday and she regaled us with her zip lining adventure. Yes, Marge flew through the trees on a zip line!!! Wow! It’s our club’s 80th anniversary and we’re celebrating on Thursday, February 11th. You can still sign up, but please be quick so we can let the caterers know. 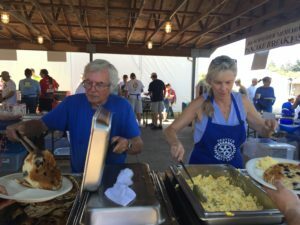 Go to www.signupschedule.com/noonrotary to sign up. 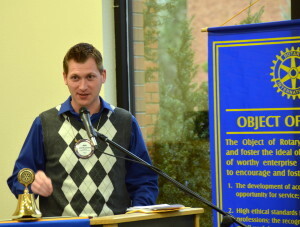 Rotarian Jack Maxwell shared the story of Provoking Hope, a life changing organization that is just five years old. Provoking Hope was started by Diane Reynolds in McMinnville and provides recovery support services for those in addiction. All the services are free. Their funding comes through insurance payments, state support and of course the generosity of donors. The program matches those in need with recovery mentors, most of whom have been in the same place. Jack is a mentor as he received help from others when he needed it and this is his way of giving back and supporting his community. Jack set up a support group, Responsible Dads, to help men learn how to be better fathers. Many didn’t have good role models growing up and now are trying to be a dad, many as non-custodial dads with limited visitation or even no visitation at all. The group works with them to be better people which lets them be better parents. Provoking Hope is right in the trenches and responds to the hospital when someone has overdosed. They support them with finding housing and recovery assistance. The organization grew from 25 clients a month in 2011 to 900 clients a month served by 60 employees and 30 paid employees in 2015. Helping Hands and Provoking Hope work together to help many of the same people and they support each other. 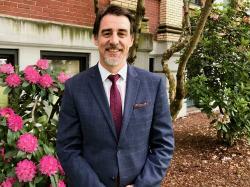 Provoking Hope mostly works in McMinnville, however as Jack said, they will go anywhere and he related that he himself has responded to a number of clients who had overdosed and were at Providence Newberg Hospital. This is great work and by listening to Jack you can see how helping someone who needs some support can return benefits by the mile. Thanks Jack for sharing and for the work you do with Provoking Hope.